One of Snapchat’s best loved features is its photo filters, which use GPS data and augmented reality to add interactive “lenses” to your photos and videos. Now, the messaging startup wants to make that offering more powerful—and lucrative. A patent application published on July 14, titled “Object Recognition Based Photo Filters,” describes lenses and filters that would be based on the picture you’re taking. For example, if you’re snapping a photo of the Empire State Building, you’d be given the option of a King Kong filter in which the ape climbs the building. The application also outlines how Snapchat could push you a free coffee offer after you post a photo of a hot cup of java. Snapchat has 150 million users who send 10 billion videos a day, and they’ve shown no resistance to using sponsored filters. One by Gatorade during this year’s Super Bowl generated 160 million impressions. But the deep image recognition software needed for the capabilities described in the patent goes further than what’s been offered to date and could make users uncomfortable. Based on the application, Snapchat would be looking at what you’re sending, where you are, and send you advertisements based on that. Snapchat declined to comment on the application. The tension between a user’s experience and building an advertising business has been a challenge faced by almost every social media company. Facebook and Twitter have had their ups and down, and so will Snapchat. The company is internally projecting sales of $250-$350 million in 2016, and between $500 million and $1 billion in 2017. 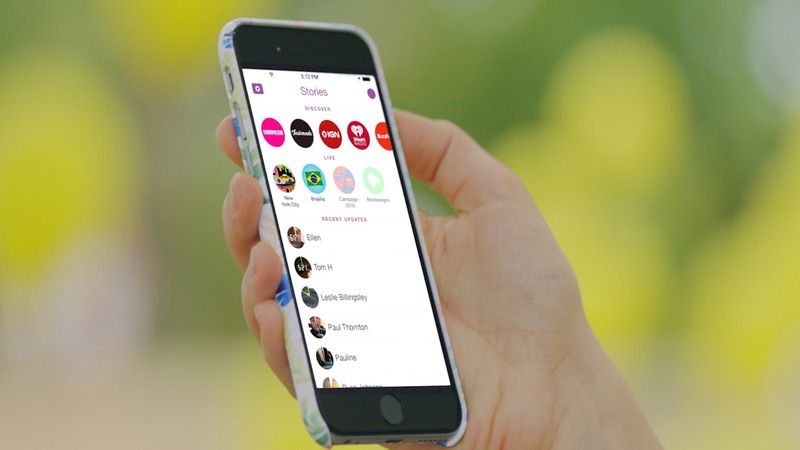 Snapchat brought in just $59 million in 2015, according to TechCrunch. Companies file patent applications that go unused all the time, and this patent has not yet been granted. But the bet is on whether or not consumers (especially young ones, like Snapchat’s core demographic) are willing to sacrifice their privacy for fun and potentially useful products. And, for Snapchat, the answer is the difference between being a hip trendy app and the next Facebook. 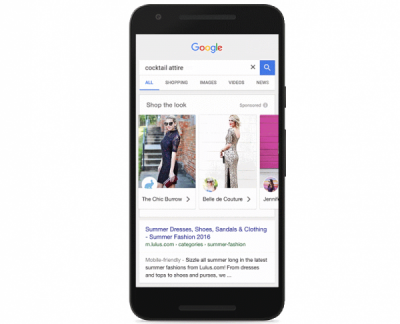 Advertising to consumers is now a more seamless experience thanks to Google. Last week, the search engine debuted “Shop the “Look,” a new apparel and home décor experience for its retail advertisers, allowing them to reach more consumers while helping brands increase visitor traffic and boost digital sales. As more consumers browse and purchase items on their smartphones, it is crucial for retailers to create mobile-friendly brand strategies. According to a recent Google study, 90 percent of mobile users said they aren’t absolutely sure of the specific brands they want to purchase items from when they start shopping. To help consumers discover products instantly, Google is building on ad experiences, including Showcase Shopping ads and Shopping ads on image search. Both options allow consumers to browse items, compare prices and purchase products without typical digital complications. 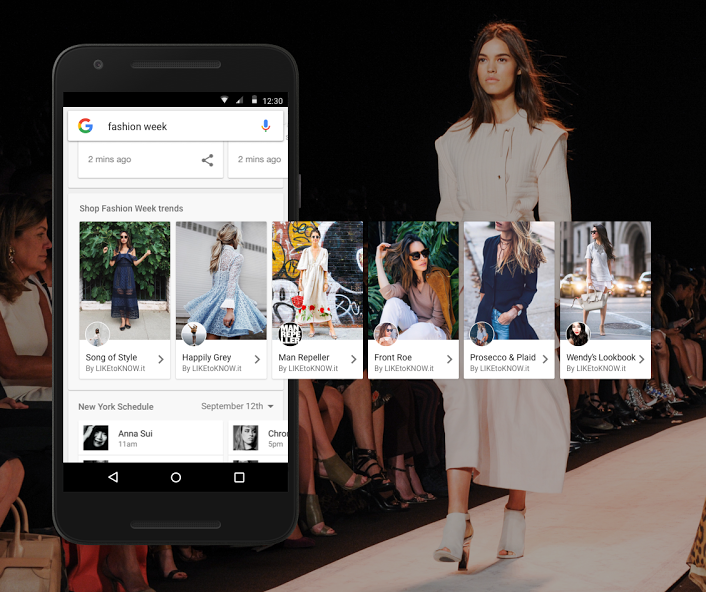 The new version allows people to explore the world of fashion and shop products directly from curated, inspirational images on google.com. First, consumers can type a particular wardrobe item, like a little black dress, into Google search. Once they hit enter, a picture of a popular fashion blogger wearing a little black dress, heels and a cross-body bag may pop up on their page. Consumers may then shop for exact or similar products found in the image with a few taps. Shop the Look images are curated by fashion partners, including Polyvore, that feature content from brands, bloggers, publishers and retailers. Similar to standard shopping ad guidelines on Google, retail advertisers will be charged on a cost-per-click basis. Retailer advertisers interested in shop the look may register with Google Shopping Campaigns. Most users of popular photo-sharing sites like Instagram, Flickr and Pinterest know that anyone can view their vacation pictures if shared publicly. 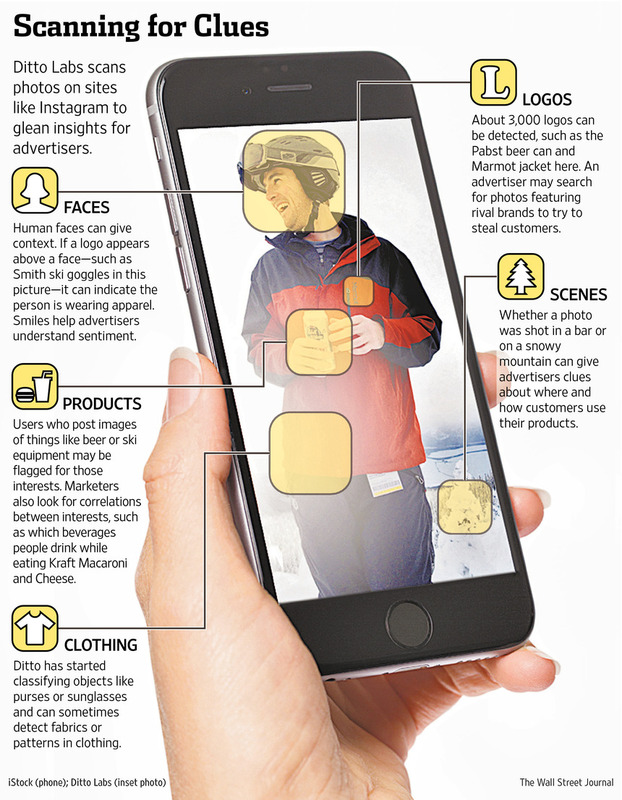 But they may be surprised to learn that a new crop of digital marketing companies are searching, scanning, storing and repurposing these images to draw insights for big-brand advertisers. Some companies, such as Ditto Labs Inc., use software to scan photos—the image of someone holding a Coca-Cola can, for example—to identify logos, whether the person in the image is smiling, and the scene’s context. The data allow marketers to send targeted ads or conduct market research. Others, such as Piqora Inc., store images for months on their own servers to show marketers what is trending in popularity. Some have run afoul of the loose rules on image-storing that the services have in place. The startups’ efforts are raising fresh privacy concerns about how photo-sharing sites convey the collection of personal data to users. The trove is startling: Instagram says 20 billion photos have already been shared on its service, and users are adding about 60 million a day. The digital marketers gain access to photos publicly shared on services like Instagram or Pinterest through software code called an application programming interface, or API. The photo-sharing services, in turn, hope the brands will eventually spend money to advertise on their sites. Privacy watchdogs contend these sites aren’t clearly communicating to users that their images could be scanned in bulk or downloaded for marketing purposes. Many users may not intend to promote, say, a pair of jeans they are wearing in a photo or a bottle of beer on the table next to them, the privacy experts say. In recent years, startups have begun mining text in tweets or social-media posts for keywords that indicate trends or sentiment toward brands. The market for image-mining is newer and potentially more invasive because photos inspire more emotions in people and are sometimes open to more interpretation than text. Instagram, Flickr and Pinterest Inc.—among the largest photo-sharing sites—say they adequately inform users that publicly posted content might be shared with partners and take action when their rules are violated by outside developers. Photos that are marked as private by users or not shared wouldn’t be available to marketers. There are no laws forbidding publicly available photos from being analyzed in bulk, because the images were posted by the user for anyone to see and download. The U.S. Federal Trade Commission does require that websites be transparent about how they share user data with third parties, but that rule is open to interpretation, particularly as new business models arise. Authorities have charged companies that omit the scope of their data-sharing from privacy policies with misleading consumers. The photo sites’ privacy policies—the legal document enforced by law as promises to consumers—vary in wording but none of them clearly convey how third-party services treat user-posted photos. While Facebook is one of the largest photo-sharing sites, the fact that most of its users restrict their photos’ access with privacy controls has deterred outside developers from mining those images. Developers commonly use Facebook’s API to pull in profile photos of its members but not for marketing purposes. An Instagram spokesman said its partnerships with developers don’t “change anything about who owns photos, or the protections we have in place to keep our community a safe place.” Flickr said it takes steps to prevent outside developers from scanning photos on its site in bulk. Spokeswomen for Tumblr and Twitter declined to comment. Jules Polonetsky, the director of Future of Privacy Forum, an advocacy group funded by Facebook and other tech companies, said users should assume that companies are scanning sites for market research if their photos are publicly viewable. But the boom in image-scanning technologies could lead to a world in which people’s offline behavior, caught in unsuspecting images, increasingly becomes fodder for more personalized forms of marketing, said Peter Eckersley, technology-projects director for the Electronic Frontier Foundation. Moreover, the use of software to scan faces or objects in photos is so new that most sites don’t mention the technology in their privacy policies. 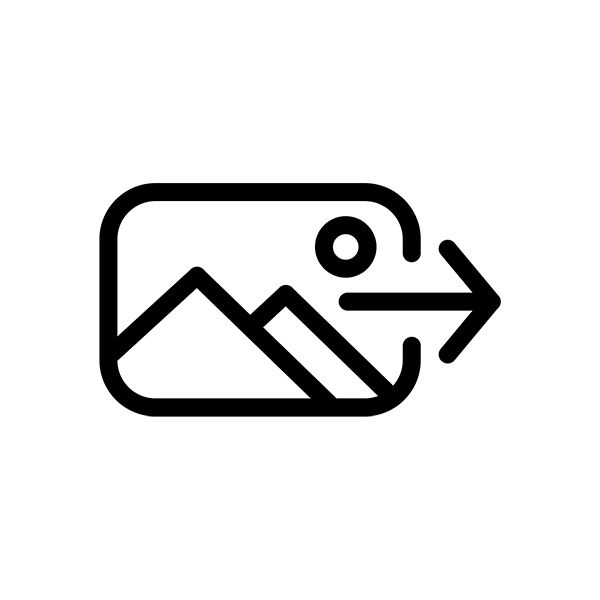 Advertisers such as Kraft Foods Group Inc. pay Ditto Labs to find their products’ logos in photos on Tumblr and Instagram. The Cambridge, Mass., company’s software can detect patterns in consumer behavior, such as which kinds of beverages people like to drink with macaroni and cheese, and whether or not they are smiling in those images. Ditto Labs places users into categories, such as “sports fans” and “foodies” based on the context of their images. Kraft might use those insights to cross-promote certain products in stores or ads, or to better target customers online. David Rose, who founded Ditto Labs in 2012, said one day his image-recognition software will enable consumers to “shop” their friends’ selfies, he said. Kraft didn’t respond to a request for comment. Mr. Rose acknowledges that most people who upload photos don’t understand they could be scanned for marketing insights. He said photo-sharing services should do more to educate users and give them finer controls over how companies like his treat photos. Beyond image recognition, some API partners employ a process called “caching,” meaning they download photos to their own servers. One of the more common uses of caching is to build a marketing campaign around photos uploaded by users and tagged with a specific hashtag. Some developers have already overstepped the rules set forth by photo-sharing sites. Last month, Pinterest learned from a Wall Street Journal inquiry that Piqora, one of seven partners in its business API program, launched in May, was violating its image-use policy. Piqora, a San Mateo, Calif., marketing analytics startup, collects photos into a graphical dashboard that help companies such as clothing and accessories maker Fossil Inc. track which of its own products and those of competing brands are most popular. This violated Pinterest’s rules, which restrict partners from using images from the site that were posted by anyone except their own clients. After Pinterest learned about the violation, the company asked Piqora to discontinue the practice and plans to begin performing regular audits of its business partners, a spokesman for Pinterest said. Fossil didn’t respond to a request for comment. Piqora co-founder and Chief Executive Sharad Verma says he has removed the ability to view competitors’ images in the dashboard. He also clarified his company’s cached photos policy from Instagram. Rather than keeping photos for an indefinite period of time, Mr. Verna said he will now delete photos from his servers within 120 days. “We might be looking at doing away with caching and figuring out a new way to optimize our software,” Mr. Verma said. — Lisa Fleisher contributed to this article.